Yes, that’s the name. I am not sure who originated the recipe or coined the catchy name, but these are by far our most popular appetizer. The jalapenos are seeded and deveined, so dont fear the heat; they are usually not that spicy. 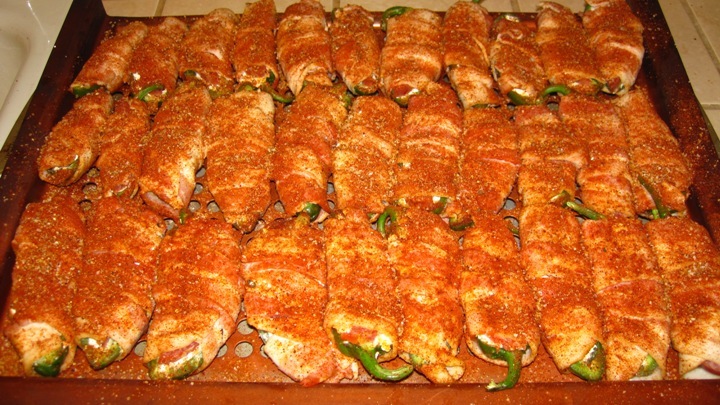 But they do have a little kick, and combined with the cheese and sausage filling, the savory bacon wrap, the sweet and flavorful BBQ rub, and a good smoking… these are a show-stopper! Here is the original recipe, but I am also sharing some modifications that I often use. 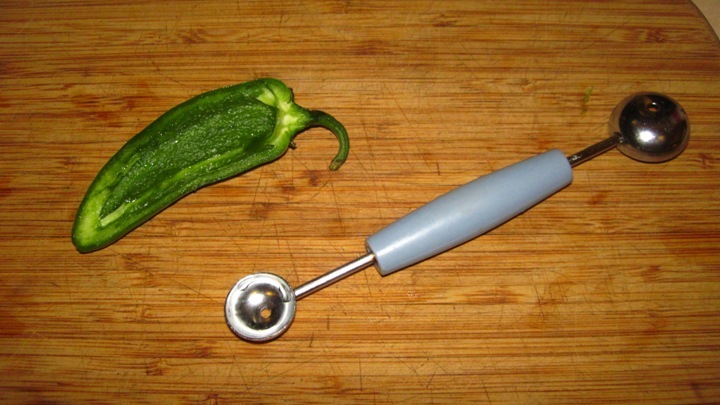 Half jalapenos horizontally with a sharp knife and remove seeds and veins (or "placenta") with a melon baller. Most people think that the seeds are the spiciest part of the pepper. But the heat, caused by capsaicin and related compounds, is concentrated in the whitish membrane (placenta) surrounding the seeds. I have seen that some people cut off the stem portion of the pepper to simplify the prep process, but this is a bad idea because you will loose some of the cheese filling during the smoking process. 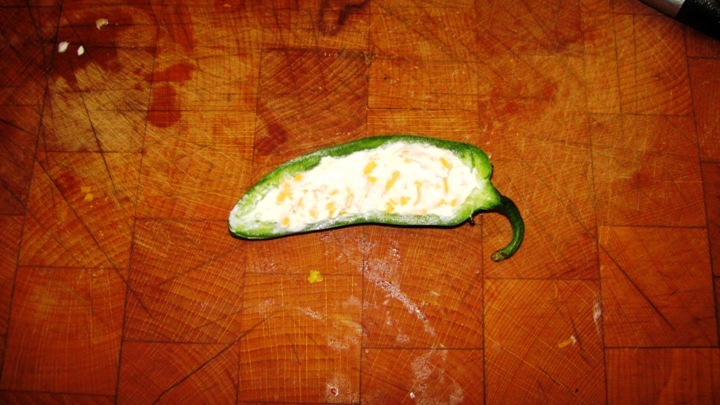 Fill jalapeno halves with cream cheese. I have diverted from the original recipe by using a mixture of cream cheese and grated cheddar cheese here. In this case it is cold smoked cheese. 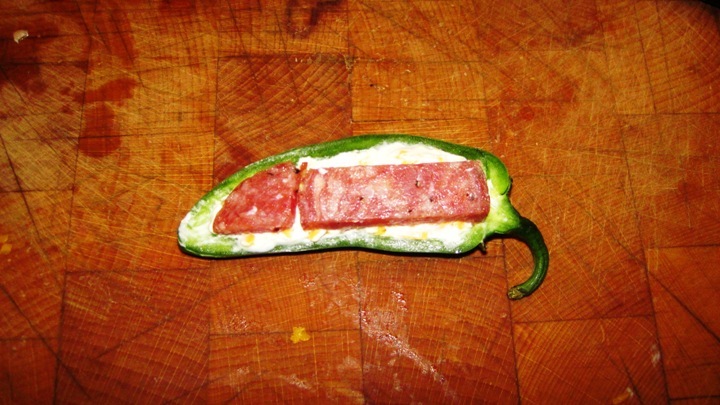 Place one “Lit’l Smokie” sausage in the cream cheese bed of each jalapeno half (or a half smokie, horizontally sliced for small jalapenos). In this case I have substituted sliced Italian salami "chubs" for the Lit'l Smokie sausage (pepperoni is even better). With the chubs, I can slice it thicker (than salami that is sold pre-sliced) and I usually go with at least 1/4 inch thick. 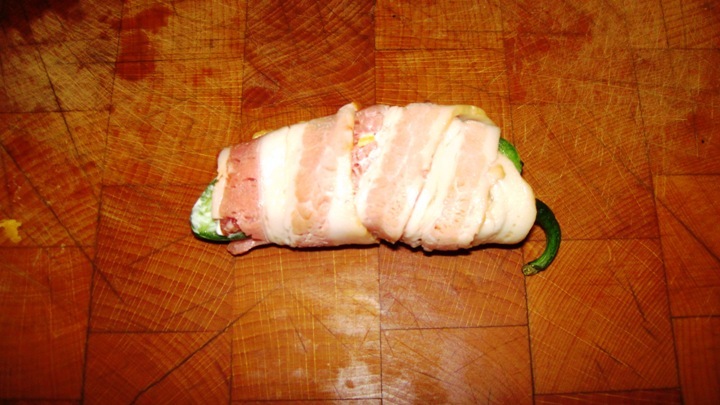 Wrap each jalapeno half with a strip of bacon. If your jalapenos are small, you can get away with a half a strip of bacon. Either way, I try to wrap the bacon so that the last wrap ends up on the bottom (uncut side) of the jalapeno. This will usually keep the bacon from unraveling during cooking. Of note; we oftentimes will make our "ABTs" with turkey bacon instead and they are quite good. Place ABTs on a perforated grilling rack or jelly rack and sprinkle with BBQ rub and/or brown sugar. I don't think the rub is in the original recipe, but I think it is very important step. I use a rub that has a good amount of sugar in it and the sweetness is a great compliment to the savory and spicy flavors of the ABTs. OK...on to the smoking process and here are methods for doing that on a smoker, charcoal grill, or gas grill: Ideal smoking temperature is 225-250 F. For cooking on an Offset or Vertical Smoker (best method): Place a charcoal starter basket full of lit charcoal in the fire box, and place 1 or 2 dry fist size chunks of smoking wood (Oak, Manzanita, Hickory, or any Fruit Tree Wood) on the charcoal. Place rack(s) of ABTs on the smoker grate and close smoker. Add more wood chunks as smoke diminishes (every 1/2 hour or so), and rotate racks of ABTs every 1/2 hour so they cook evenly; smoke ABTs until bacon is browned (1.5 -2 hours). For cooking on a Covered Charcoal Grill (such as a Weber Kettle): Heat will need to be much lower than for grilling, so start with 10 coals in a basket on one far side of the grill and add more if necessary to bring the BBQ temp (when covered) to the 225-250 F range. You can monitor temperature best by putting a heat proof thermometer probe in the lid vent. If it overheats, you can adjust temp by adjusting bottom vents and/or removing/adding charcoal. Add one dry fist sized chunk of smoking wood on top of charcoal. Place ABT racks on side of grill opposite coals, and place lid so exhaust vent is over ABTs (and open). Add more wood chunks as smoke diminishes (every 1/2 hour or so), and rotate racks of ABTs every 1/2 hour so they cook evenly; keep “peeking” to a minimum in order to maintain your cooking temperature. 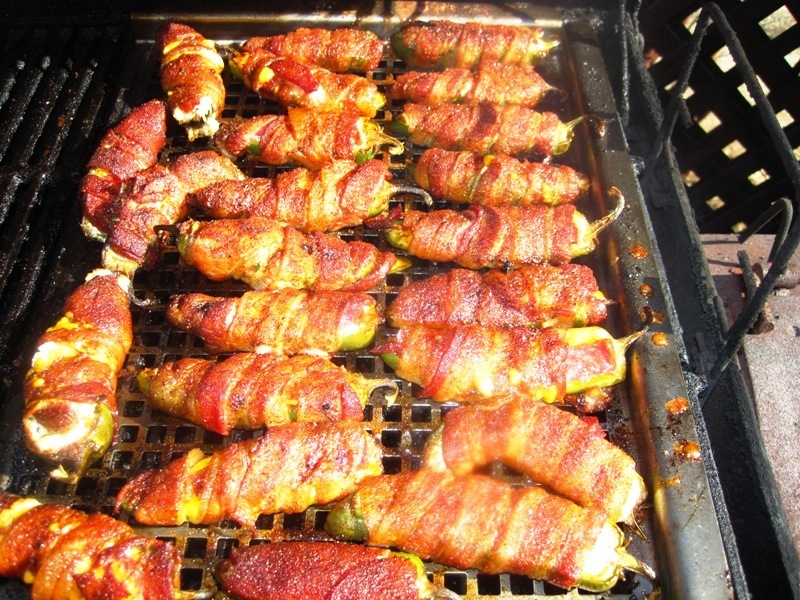 Smoke ABTs until bacon is browned (1.5 -2 hours). For cooking on a Gas Grill: Soak wood chips in a small disposable aluminum tray for at least an hour and then drain. Before heating grill, lift cooking grates off and place tray with chips on “flavorizer bars” (or on ceramic briquettes/lava rock if that is what your grill has) on one side of the grill. Replace grate and turn heat of all burners to high. When chips begin to smolder, turn off burners that are not under the chip tray and place ABT racks over the area of the grill where the burners are now turned off. Adjust temperature of burner under tray to keep temperature at 225-250 F, and rotate racks of ABTs every 1/2 hour so they cook evenly; keep “peaking” to a minimum in order to maintain your cooking temperature. Smoke ABTs until bacon is browned (1.5 -2 hours). Oven Cooking: I am often asked if you can cook ABTs in an oven, and yes you can, but they will definitely not be as good as those that are smoked. So, I don't recommend it, but if you must, cook the ABTs uncovered on a baking sheet at 275 F until browned, probably 1 to 1-1/4 hours. I use this rub for the Atomic Buffalo Turds, Pulled Pork, and Pork Ribs. If you don't want to use a rub for the ABTs, at least sprinkle some brown sugar on them before smoking. You can sprinkle your rub and/or brown sugar on both sides if you want, but make sure the cut side of the pepper is up when they go on the smoker.